These Ford HEI Street/Strip Distributors are 100% New and fit the Ford 289-302 (5.0) Motor. Utilizing the durable and dependable High Energy Ignition (HEI) system pioneered by GM, these distributors avoid the unsightly wiring of stock Ford electronic ignition systems by installing this one-piece distributor with an internally positioned coil and module. Easy to install: just connect one 12-volt hot wire to the distributor (has optional tach hook-up). These units offer calibrated advance curves that are optimized for maximum combustion efficiency and for the elimination of detonation damage and throttle ping. Assembled from precision-madeparts for advance curve smoothness. Offers longer term durability and a higher voltage spark that permits a bigger spark plug gap, resulting in more power and reduced plug fouling. Each unit includes a high-power coil, a premium hi-dielectric cap with brass terminals, and a low-saturation ignition module. 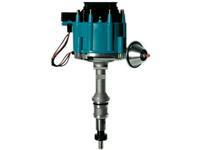 By eliminating the stock-Ford ballast resistor, more ignition voltage results in improved spark. 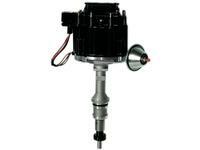 Incorporates easily found High Energy Ignition (HEI) replacement parts. Assembled with upper and lower bushings (stock Ford distributors have only a single bushing). Technical Note: Gear not compatible with roller cams. If using roller cams, please contact the cam manufacturer for proper gear selection. Ford 351 Windsor HEI Distributor Built In Coil. Blue Cap.